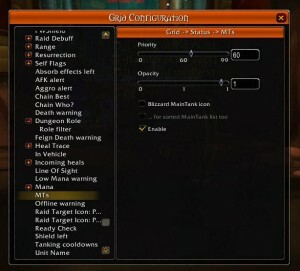 The person assigned the role of “tank” in a instance entered using the dungeon finder interface. You knew you’d have to download a plugin, right? 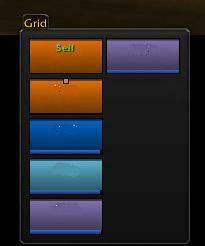 GridStatusMTs. Go get it. 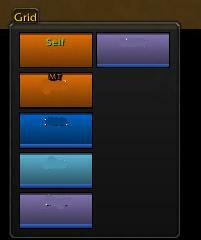 You don’t get to select a color. Lame. A plain brown box on the top of the other druid’s frame. Honestly, I’ve been running with this for a while. It’s simple and does the trick. 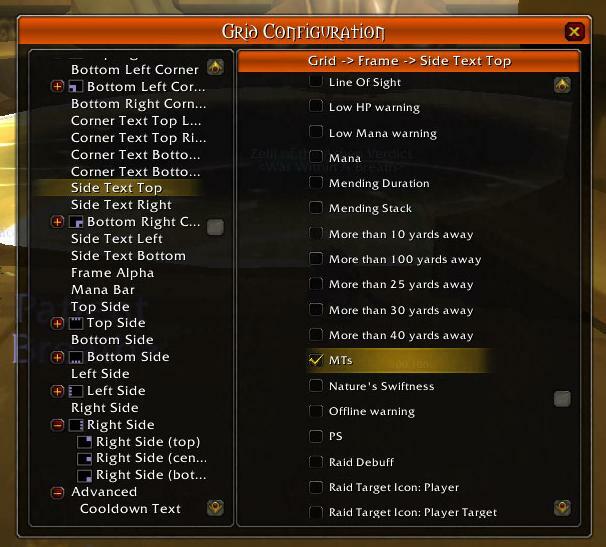 To do this, you’ll need a text indicator plugin, such as GridIndicatorSideText or GridIndicatorCornerText. 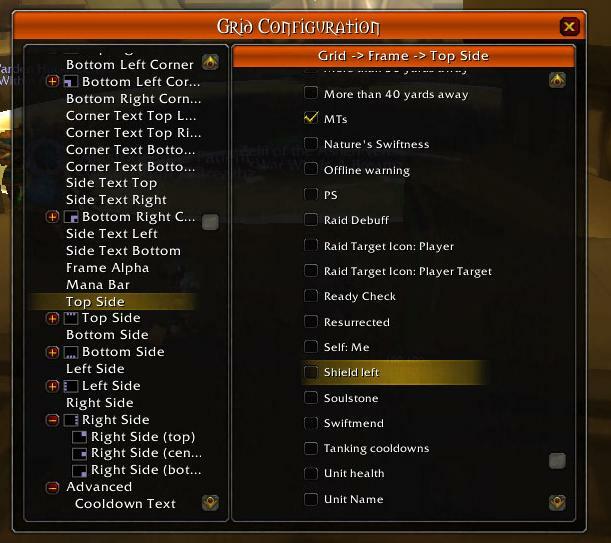 Set up the same way as above, but make sure you use the corner/side text option. Fail. Total fail. I hates it, precious. 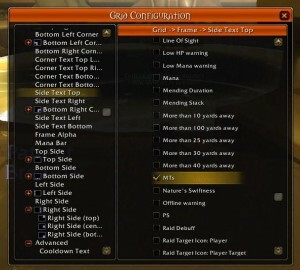 Again, setup is the same, except make sure to use the center/side/whatever icon option. It is HIDEOUS. It BURNS. Worst. Icon. Ever. But wait! We can fix it. 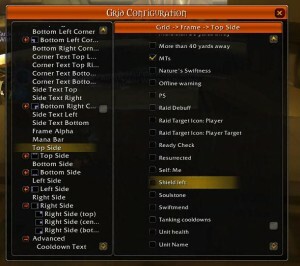 Go back into the config and change the MT icon to the Blizzard Main Tank Icon. And now how does it look? Omg CUTE! Right? CUTE! I approve. 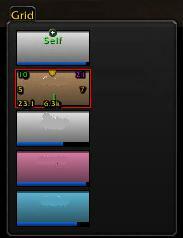 And, sure enough, this is what I’m using for my tank indicator in both raids and instances. 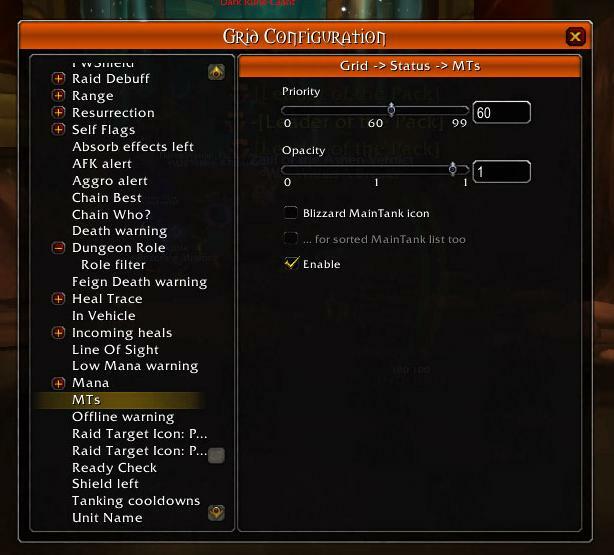 I’m using GridStatusDungeonRole filtered to show healer only in dungeon finder instances2 and using GridStatusMTs for all my tank-display needs in both raids and dungeon finder instances. This is how my setup looks in a random. Fancy!